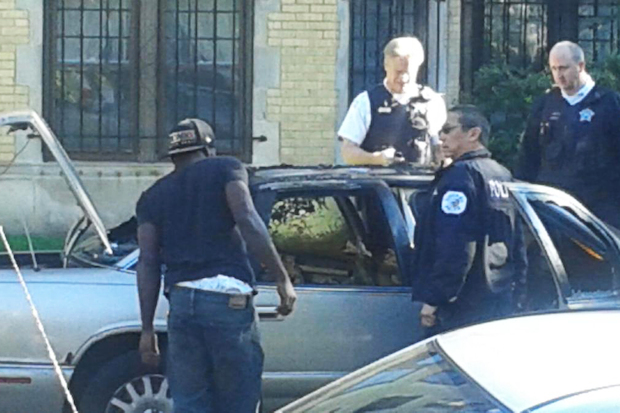 ROGERS PARK — A car believed to belong to rapper Bang Da Hitta was intentionally set ablaze about 4 p.m. Saturday, police said, and witnesses said an "incendiary device" caused an explosion in the car. "We heard this pop, then we looked up and saw this explosion," said Don Gordon, who was gardening at the time with his family in the 1200 block of West Lunt Avenue. "These flames were shooting outside of the window of the car; it was quite unnerving." Police said a fire to the car was intentionally set around 4 p.m., but said incendiary devices were not used to ignite it. The incident is gang related, police said. An investigation is ongoing. Gordon and other witnesses said the car was attacked. Craig Gernhardt, who also lives on the block, said he saw rapper Keith Hayer — aka Bang Da Hitta — who's known for publishing provocative music videos that disparage rival gang members, run to his burning car while the fire department extinguished the flames. Gernhardt took several photos of the burned-out car. "Seeing it on TV when it happens in Baghdad is different than when it happens 100 feet away under your nose — it's a little more intense," Gordon said. Gordon said he saw a white car flee the scene after the initial explosion. "It's a war zone," he said. A post on Hayer's rap persona Facebook page read: "Owow Yall Blow Up Carz.. But B---- We Blow Up Bodyz.. I Aint F--- Up Bout It Tho." Gordon said police arrived about a minute after he called 911 to report the attack. "It was definitely some type of incendiary device that did this," he said. Gordon said he worried about the safety of other people living in the neighborhood. "All that was was a warning," he said. "What happens next time? Does this end up like Devon?" he said, referring to the fatal shooting of bystander Wil Lewis in July. "I mean, what the hell?" Gordon said. "We've got to do something."